With the March 26, 2014 adoption by the UN Human Rights Council (HRC) of a new resolution about the “Situation of human rights in the DPRK,” the governments of the world have begun the process of endorsing, by a landslide majority, the findings, conclusions, and recommendations of the UN Commission of Inquiry (COI) on the unparalleled human rights violations in the DPRK. Thirty governments voted “yes” to the HRC resolution initially co-sponsored by the European Union and Japan, with only six governments voting “no.” Eleven governments abstained on the measure. The Human Rights Council is a 47 Member State subsidiary body of the 193 Member State General Assembly. The COI had been requested by the March 2013 session of the HRC. The 400-page report released to the press on February 17, 2014 and presented at the Council on March 17, relentlessly catalogues North Korea’s human rights violations. The COI’s principle conclusion is that many of the catalogued human rights violations constitute crimes against humanity. The lopsided vote at the HRC gives considerable momentum to further actions at the UN, as the governments of the world have gone from “deep concern” to “condemnation, in the strongest terms” of the DPRK’s gross violations of internationally recognized human rights. On the basis of its findings and conclusions, the COI made some six pages of recommendations for action. The overwhelming adoption by the HRC, the UN body that initiated the COI, of this new resolution provides the mandate for member states to pursue these recommendations. This 38 North article examines four key COI recommendations: 1) North Korean human rights violations should be recognized as crimes under international law; 2) an “accountability exercise” should be initiated with respect to those atrocities; 3) “targeted sanctions” should be imposed against the North Korean governmental organs most responsible for the severe violations; and 4) the UN needs to follow up the work of the COI. Since 2005, the resolutions on North Korean human rights violations that were adopted at the spring session of the Human Rights Council have been subsequently introduced at the autumn sessions of the General Assembly (GA). In all likelihood, the COI will make a presentation to the G, and following this presentation, a resolution, very similar to the one just past at the HRC will be introduced at the GA. It is likely that by the end of 2014, the member governments of the United Nations will condemn the crimes that North Korea is committing against its own people. In the short run, it is likely that the DPRK will ignore such a GA resolution, just as it ignores the resolutions of the Security Council on North Korea’s nuclear weapons and missile programs. Notwithstanding, human rights advocates hope that, in the long run, such a condemnation by the governments of the GA will encourage the North Korean leadership to realize that its long-denied human rights problems are something that must be tackled and ameliorated if the DPRK seeks to obtain respect, normalized diplomatic relations, and large-scale trade, aid, and investment from the international community. There are three ways a matter can be put on the agenda of the Security Council: 1) governments on the Security Council can raise it; 2) the UN Secretary General can propose it; or 3) the General Assembly can refer an issue to the Security Council. The Human Rights Council deliberately posited the route to the Security Council through the General Assembly, as this approach would demonstrate strong support among world governments for an ICC referral. In mid-April, informal deliberations among Security Council member governments and relevant parties will take place. These meetings should test the waters for more formal consideration. Normally, the “situation of human rights in the DPRK” would not be taken up at the UN (in New York) until sometime in October or November, when the COI, or at least the ongoing Special Rapporteur for Human Rights in the DPRK, former Indonesian Attorney General Marzuki Darusman, makes his report to the GA’s “Third Committee.” Following that presentation and discussion, a resolution on human rights in North Korea—again, primarily sponsored by the EU and Japan—will likely be taken up by the GA in November or December. If the path charted in the HRC resolution is adhered to, formal Security Council consideration of North Korea’s atrocity crimes may be some months off. But the situation is fluid. Much will depend on the outcome of the mid-April informal deliberations. Additionally, the Security Council seems likely to discuss North Korea’s most recent missile tests in the coming months, and Pyongyang has hinted at additional tests to strengthen its nuclear deterrent. 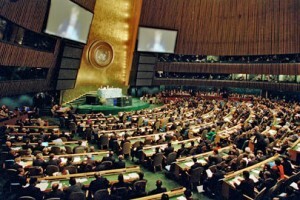 Security Council decisions are decided by great power politics, exactly as the drafters of the UN Charter envisioned it. It is commonly assumed that China will veto any such Security Council referral to the ICC. Surely, that is the safe bet for smart money. However, the Chinese position is more nuanced and circumspect. The portion of the COI report they took strong objection to was the direct criticism of China for ignoring its obligations under the refugee conventions and forcibly repatriating North Koreans back to the DPRK where the persons refouled from China are subjected to punishments so brutal as to qualify as crimes against humanity. At the Human Rights Council, China reaffirmed its position that it is merely deporting illegal immigrants. China voted against the resolution, citing the “principled position” of the non-aligned movement that opposes citing any UN member state by name for human rights violations, rather than on the grounds of defending North Korea. In fact, at the HRC debates, China said not one kind word in defense of North Korea’s human rights policy or practice. Instead, what Beijing has done is, in effect, to pocket the forthcoming possibility of having to use or not use its veto power at the Security Council as de facto leverage in its ongoing dealings with both the DPRK and the United States. A Chinese veto is neither automatic nor unconditioned by related events and relationships. To date, China has not said that it would be unwilling to abstain in the face of the probable strong majority vote at the Security Council for an ICC referral motion. Of course, Russia can also veto an ICC referral motion, and who knows if Russian resentment over the EU and US rejection of their annexation of Crimea will spill over into non-cooperation in other areas such as Syria or North Korea? When the time comes, will the US be satisfied that China is putting enough pressure on North Korea over its weapons programs? Will the US want to put China in a position where it will have to either veto or abstain, or will it need its capital on some other issue? Will Russia pose opposition on political grounds? There are certainly strong human rights arguments for pressing for an ICC referral, but still some may be more concerned with overall big power politics on multiple geopolitical and security issues in East Asia, of which, could overshadow the human rights agenda once again. Many have long favored Security Council consideration of human rights and humanitarian issues on the Korean peninsula in addition to North Korea’s nuclear weapons and ballistic missile programs. It seems that this is now quite possible, although the outcome and effect remain, of course, to be seen. Concerned UN Member States do not now intend to let the findings, conclusions, and recommendations of the COI drop. The latest HRC resolution renews the role of the Special Rapporteur on the situation of human rights in the DPRK (currently Marzuki Darusman) who reports annually to both the Human Rights Council and the General Assembly, and tasks the Office of the High Commissioner for Human Rights to set up a field office to continue to monitor and document human rights violations in North Korea. This will likely be a small office in Seoul, Tokyo, or Bangkok, where the UN already has a very large office complex, the Economic and Social Council for the Pacific (ESCAP). The new field office for DPRK human rights violations is also given mandates for advocacy, capacity building, and outreach to concerned governments and civil society. Assuming this new office will have access to recently arriving North Korean refugees and defectors, it would facilitate both the tracking of positive or negative changes in DPRK violations and interaction with governmental and civil society organizations doing the same. It would also allow the interjection of human rights concerns in UN deliberations at a wide variety of levels. Voting “yes”: Argentina, Austria, Benin, Botswana, Brazil, Burkina-Faso, Chile, Costa Rico, Cote d’Ivoire, Czech Republic, Estonia, France, Germany, Ireland, Italy, Japan, Kazakhstan, Maldives, Mexico, Montenegro, Morocco, Peru, Philippines, South Korea, Sierra Leone, Romania, Macedonia, United Arab Emirates, and the United States. Voting “no”: China, Cuba, Pakistan, Russia, Venezuela and Vietnam. Abstentions: Algeria, Congo, Ethiopia, Gabon, India, Kenya, Kuwait, Namibia, Saudi Arabia, and South Africa. A/HRC/25/63, February 7, 2014, and the 371 page annex, A/HRC/25/CRP.1, February 7, 2014. 858 numbered paragraphs with 1,417 footnotes on some 270 pages. An additional 46 pages with 143 numbered paragraphs and 327 footnotes detail how the gross human rights violations meet the high threshold for determining atrocity crimes in contemporary international law. Some 19 recommendations to North Korea, 6 recommendations to China (having largely to do with stopping the forced repatriation of North Koreans back to the DPRK) and 14 recommendations to the other governments that comprise the contemporary international community. Operative paragraph 2 (a) through (f). The COI report also discuses the option of creating an Ad Hoc Tribunal, similar to the Yugoslav and Rwanda tribunals, because jurisdictionally, the International Criminal Court can only consider crimes occurring after mid-2002, when the Rome Statutes of the ICC entered into force. The COI reports that North Korea’s ongoing criminal acts were initiated decades ago. Thus, an Ad Hoc tribunal could take a more comprehensive accounting. The ICC, however, was created precisely to obviate the necessity of additional, very expensive and time consuming, criminal tribunals. This requires 9 out of 15 votes. As the agenda is “procedural,” it is not subject to veto. The current members of the Security Council are Argentina, Australia, Chad, Chile, Jordan, Lithuania, Luxembourg, Nigeria, South Korea, and Rwanda, in addition to the Permanent Five members, Britain, France, the US, China and Russia. As a subsidiary body of the General Assembly, the Human Rights Council itself cannot directly refer an issue to the Security Council. During the Human Rights Council debates, 14 governments explicitly advocated such action. The Third Committee of the General Assembly addresses issues of social, humanitarian, and cultural concerns. “North Korea Stages Drill, Warns on Nuclear Test,” Wall Street Journal, March 31, 2014.